While we sleep, cute dream monsters fill the dream realm to bring our minds happy thoughts, but during nights with a blood moon our nightmares are at their strongest. 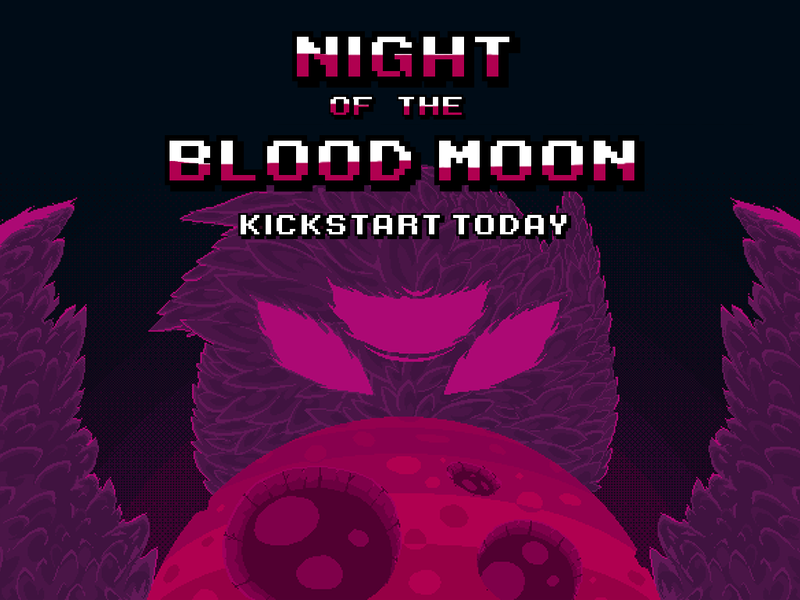 Night of the Blood Moon lets you play as a nightmare beating up cute, fluffy, lovable creatures. No longer do you have to play as a hero beating up skeletons! Now you can beat up all those fluffy things which have infuriated you with their cuteness for too long! Currently there are 5 unlockable weapons implemented, and more incoming. These tools are what make Night of the Blood Moon so enjoyable for us. They all require interesting and different types of positioning and movement. At all times The Three Eyed Crow can also dodge and slash. Bosses in Night of the Blood Moon are going to be more than just bullet sponges. The common bullet sponge boss bothers me in games, and I'd like to provide some alternatives to our games. Bosses will have mechanics which can be overcome through trial, error, and understanding. I take inspiration from some MMO's who's bosses weaknesses come from mechanics, and not hp. Some of the critters will have unique functions in order to unlock them as pets each round. They'll serve unique tasks for you. Pets are always displayed in a blue version of the creatures... Everyone loves pets. The Boomerang will let you set up knockback both outgoing and incoming, allowing for maximum damage. You can bounce it off walls, but sometimes you might drop it if you're not careful. The Hookshot will let you grapple onto enemies. "GET OVER HERE". Or alternatively act like a Zelda game as you grab onto walls and pull yourself to safety, or if you're bloodthirsty, combat. With the combination of your dodge and slash this is the ultimate form of mobility. Poisoning an enemy will cause a damage over time effect which is spreadable to other enemies, and you. This is a great way to take care of clustered enemies, but watch out for enemies who are close range. The Bombs bounce off walls and explode on impact with you and the dream creatures. This is great for high damage, and a one hit kill on many enemies, but if you misplace your throw it could come back to haunt you! The Crossbow feathers are my take on most weapons in the modern Rogue / Bullet Hell. This will be one of the beginning and unlocked weapons due to the common feel to other games. Ammo in Night of the Blood Moon is restored with killing. After playing DOOM 2016, I loved the dance we perform while weaving between monsters, and using melee mechanics to restore health. This game kept you in the action, instead of asking the player to run and hide while health recovers. I have done the same with ammo. Running out of ammo does not mean retreat, but instead forces you to position yourself perfectly for your melee strikes. Along side a new trailer with a more intense and gothic feeling, I developed one of the first bosses you'll encounter in Night of the Blood Moon.